G.Skill has another mechanical keyboard that it's adding to its growing pile of planks. This latest one is the Ripjaws KM570 RGB with a rather simplistic (intentionally so) design for gamers who are tired of the funky looking keyboards that are often thrown at them from peripheral makers. While we haven't seen the KM570 RGB in person, it appears as the though the only piece of flair is the customizable RGB backlighting. Beyond that, it's a standard looking rectangular keyboard, save for a contoured design to make it easier to reach all five levels of keys. It doesn't have the aggressive (and sometimes gaudy) styling of some of its competitors. The simplistic design philosophy also means it's short on features. You won't find any dedicated macro keys here, nor are there standalone media controls, LCDs displays, and so forth. While the KM570 RGB is missing some amenities, it does support on-the-fly macro recording, full n-key rollover, per-key lighting customization, 100 percent anti-ghosting, and onboard memory for saving your personalized settings. 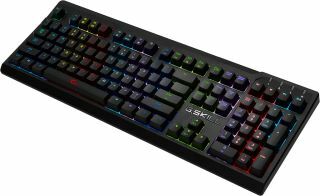 As for the keys, G.Skill offers the KM570 RGB with Cherry MX Blue, Brown, and Red key switches (check out our guide on key switches that explains the differences). G.Skill says the Ripjaws KM570 RGB will be available on Newegg in early December with Cherry MX Red and Brown switches for $120 MSRP. A version with Cherry MX Blue switches will be available in January of next year for the same price.